Meerkat in (meta)Verse ...: "Willing to be misunderstood" -Innovators. "Willing to be misunderstood" -Innovators. 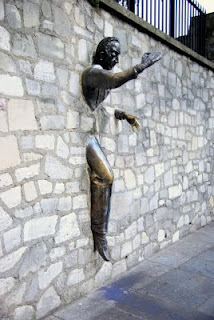 Some times we have to walk through walls to achieve what we really believe deep down. We may very well be the only ones holding on to a dream, an idea, a better way or doing business. This year has been such a year for me - a year to walk through walls. When I was in Paris last year, we stumbled upon a statue sculpted by the famous French actor Jean Marais (1913-1998) to commemorate the most famous story of author Marcel Aymé (1902-1967), "Le Paisse-Muraille” or “The Man Who Could Walk Through Walls." I share the moment with the co-founder of our company, and a good friend. Little did I know I had to walk through another wall or two this year before breakthrough. And it was painful. It still is. More times, we have to be 'willing to be misunderstood' to risk ridicule and loss, because we may (just may!) gain happiness or success. I have seen this happening earlier this year. But being true to self and taking risks for the sake of a better world (of becoming a better person even) is at the heart of the innovator, the entrepreneur. There are few better examples of innovators loving beauty, than Steve Jobs. I am thankful for you, Mr. Jobs. That is all.